Valentine’s Day is the celebration of romance and romantic love in many regions around the world. Valentine’s Day is celebrated each year on February 14. It originated as a western christian feast day, celebrating a Saint named Valentinus. When we think about Valentine’s Day, flowers, chocolate and sending cards comes to our mind. We reach out to ones we love, including parents, children and close relatives. We also want to celebrate the day with that special someone in our lives. We want to show them how much we care by offering a romantic gesture. That gesture may involve going out to dinner or staying home. Whichever we chose, we want the day to have a “romantic” focus taking us back to the early days of our courtship. Last year I set a Casual, Romantic Pink & Gray Valentine Tablescape in the kitchen and prepared The Very Best Strawberry and Cream Trifle Recipe. Another idea for a more intimate dinner for two involves setting up a make shift table. I set a table up in front of our fireplace. Creating a Romantic Dining Table for Two doesn’t have to involve a ton of work, just a little thought and planning. This year I set a romantic table for two in our dining room. To make it a unique experience I brought in my favorite wingback chairs HERE from our family room. They are so comfortable and are typically used for lounging, but I thought it would be enjoyable to use them for dining. It’s also fun to sit side by side with your special someone, a bit of a non traditional setting but still romantic. I pulled out our special Limoges China that we have collected over the years. Using gold glass chargers from Hobby Lobby HERE as a base, I paired them with french blue plates with gold rims. In staying with a gold theme, I am using glasses I purchased from a thrift store, but I have seen similar ones at Home Goods HERE. You know how I love fresh flowers! And what better time to purchase a dozen roses than Valentine’s Day. I don’t believe in overpaying for roses 🌹 especially on Valentine’s Day, grocery stores usually carry them year round at reasonable prices. To get the best bang for your buck, Costco is my go to for roses, 2 dozen for less than $20. A runner of seeded eucalyptus always looks beautiful on a table laid down the center and paired with roses. Have you ever used gold candles HERE? I don’t typically buy them but they do add a special touch to a table and they look very pretty when lit. My blush pillows HERE have traveled around my home. They are some of the most versatile pillows I have ever owned, I use them all year round and they look beautiful with so many fabric colors and textures. Gold flatware HERE was a recent purchase around the holidays. I held off so long but couldn’t resist the soft brassy look. Mixing and matching of porcelain is fun! Bring out your fine china and spend time playing with different combinations, there are so many looks you can create with what you already own. I love blending different settings and playing with color, give it a try and let me know what you come up with for your next tablescape. Tag me on Instagram HERE if you use my ideas for inspiration. What are your plans for Valentine’s Day? Do you prefer to stay in or go out? Typically we stay in if February 14 lands on a weekday and then we celebrate with dinner out on the weekend. But this year we have an amazing trip planned, and I can’t wait! I will share all the details with you soon on this once in a lifetime opportunity! Stay tuned! 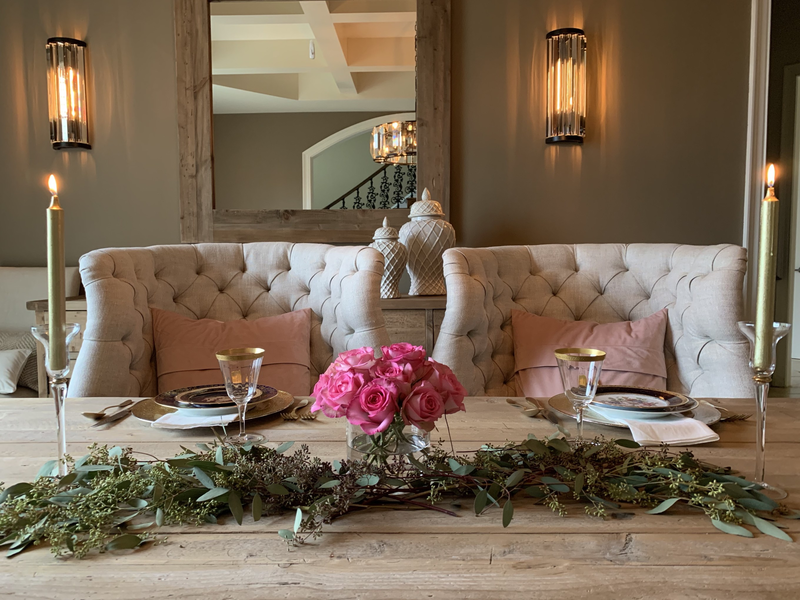 Subscribe to Happy Haute Home to receive tablescape tips right to your inbox, and follow along on Pinterest HERE, and Twitter HERE and feel free to pin and tweet your favorite pics from Happy Haute Home. SO Beautiful, Denise! I love that you brought out the comfy chairs – I”m going to give that a try! Your home and ideas are always so inspiring! Thanks! I would love to sit on your beautiful romantic kitchen table and have your enticing sweet desserts 🙂 Love your romantic settings, Denise! Perfect for Valentine! Ok thank you sweet friend, you are too kind. Hugs! Have a wonderful Valentine’s Day! Thank you Lynn, I love playing around with different arrangements and styles. Hugs to you my friend. You’re so fancy! I love it. Enjoy your trip! LOL! Thanks Toya!! Pinch me, heading to the Grammy’s!! WHAAAAAAAT!!!!!!! Do you need a plus one? I CAN NOT wait to hear about this! Swoon! LOL!! Going with my hubby…going to be a blast! Can’t wait!